(Phys.org) —Carbyne will be the strongest of a new class of microscopic materials if and when anyone can make it in bulk. If they do, they'll find carbyne nanorods or nanoropes have a host of remarkable and useful properties, as described in a new paper by Rice University theoretical physicist Boris Yakobson and his group. The paper appears this week in the American Chemical Society journal ACS Nano. Carbyne is a chain of carbon atoms held together by either double or alternating single and triple atomic bonds. That makes it a true one-dimensional material, unlike atom-thin sheets of graphene that have a top and a bottom or hollow nanotubes that have an inside and outside. It has twice the tensile stiffness of graphene and carbon nanotubes and nearly three times that of diamond. 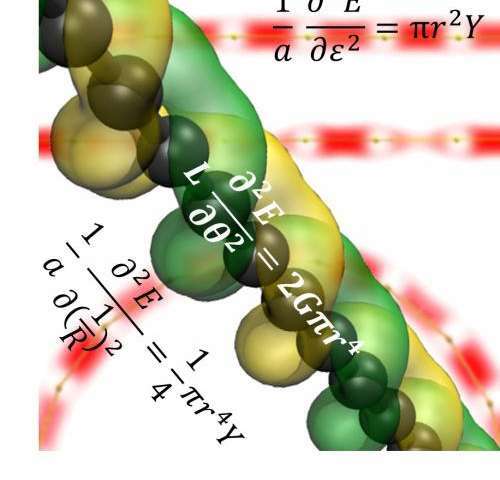 Stretching carbyne as little as 10 percent alters its electronic band gap significantly. If outfitted with molecular handles at the ends, it can also be twisted to alter its band gap. With a 90-degree end-to-end rotation, it becomes a magnetic semiconductor. Carbyne chains can take on side molecules that may make the chains suitable for energy storage. The material is stable at room temperature, largely resisting crosslinks with nearby chains. That's a remarkable set of qualities for a simple string of carbon atoms, Yakobson said. "You could look at it as an ultimately thin graphene ribbon, reduced to just one atom, or an ultimately thin nanotube," he said. It could be useful for nanomechanical systems, in spintronic devices, as sensors, as strong and light materials for mechanical applications or for energy storage. "Regardless of the applications," he said, "academically, it's very exciting to know the strongest possible assembly of atoms." Based on the calculations, he said carbyne might be the highest energy state for stable carbon. "People usually look for what is called the 'ground state,' the lowest possible energy configuration for atoms," Yakobson said. "For carbon, that would be graphite, followed by diamond, then nanotubes, then fullerenes. But nobody asks about the highest energy configuration. We think this may be it, a stable structure at the highest energy possible." Theories about carbyne first appeared in the 19th century, and an approximation of the material was first synthesized in the USSR in 1960. Carbyne has since been seen in compressed graphite, has been detected in interstellar dust and has been created in small quantities by experimentalists. "I have always been interested in the stability of ultimately thin wires of anything and how thin a rod you could make from a given chemical," Yakobson said. "We had a paper 10 years ago about silicon in which we explored what happens to silicon nanowire as it gets thinner. To me, this was just a part of the same question." The Rice researchers, led by Rice graduate student Mingjie Liu and postdoctoral researcher Vasilii Artyukhov, were aware of a number of papers that described one property or another of carbyne. They set out to detail carbyne with computer models using first-principle rules to determine the energetic interactions of atoms, Artyukhov said. "Our intention was to put it all together, to construct a complete mechanical picture of carbyne as a material," Artyukhov said. "The fact that it has been observed tells us it's stable under tension, at least, because otherwise it would just fall apart." Yakobson said the researchers were surprised to find that the band gap in carbyne was so sensitive to twisting. "It will be useful as a sensor for torsion or magnetic fields, if you can find a way to attach it to something that will make it twist," he said. "We didn't look for this, specifically; it came up as a side product." "That's the good thing about studying things carefully," Artyukhov said. Another finding of great interest was the energy barrier that keeps atoms on adjacent carbyne chains from collapsing into each other. "When you're talking about theoretical material, you always need to be careful to see if it will react with itself," Artyukhov said. "This has never really been investigated for carbyne." The literature seemed to indicate carbyne "was not stable and would form graphite or soot," he said. Instead, the researchers found carbon atoms on separate strings might overcome the barrier in one spot, but the rods' stiffness would prevent them from coming together in a second location, at least at room temperature. "They would look like butterfly wings," Artyukhov said. "Bundles might stick to each other, but they wouldn't collapse completely," Yakobson added. "That could make for a highly porous, random net that may be good for adsorption." Artyukhov said the nominal specific area of carbyne is about five times that of graphene. When the team's paper became available this summer on arXiv, the scientific press and even some of the popular press were so excited over the calculations that they picked up on the paper and its implications before the team submitted it for peer review. Now that the complete paper is ready for public consumption, the researchers said they'll carry their investigation in new directions. They're taking a more rigorous look at the conductivity of carbyne and are thinking about other elements as well. "We've talked about going through different elements in the periodic table to see if some of them can form one-dimensional chains," Yakobson said. I smell a space elevator in the nearer term now. We NEED it. "An early example of a substance similar to monomolecular wire is shigawire, as described in Frank Herbert's Dune novels... Monomolecular swords are used by some Kzin in Larry Niven's Known Space series. They are made of monomolecular wire held rigid by a stasis field and they have small bright balls on the end so the user can see where the sword is." Damn...the stuff does not even sound real does it?! Even making it, the method of manufacture seems hugely difficult to replicate on a vast scale, like, say, making steel or concrete for industry...BUT. Truth IS stranger than fiction - cannot wait to see it!